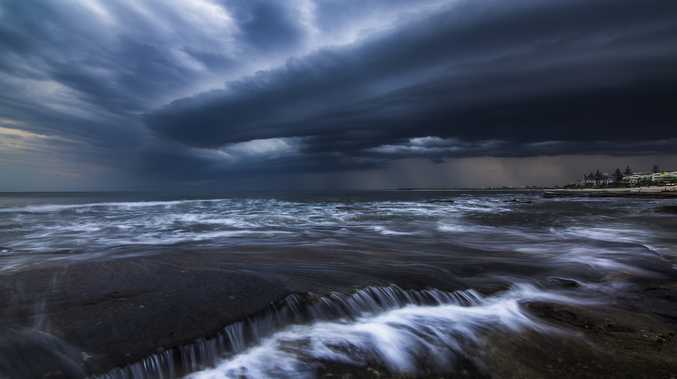 THE Bureau of Meteorology is warning severe thunderstorms are likely on the Sunshine Coast this afternoon with the effects likely to be felt from around 2pm. A severe rating entails the likelihood of gusting winds to 90kmh, hail in excess of two centimetres in diameter, heavy rain that causes flash flooding or tornadoes or any combination of one or more of those elements. Forecaster Richard Wardle said a southerly change moving into southern Queensland from NSW would be felt on the Gold Coast from around 10am, Brisbane from around noon and then Sunshine Coast from 2pm. Its cooler air is expected to lift the moist, warm air mass now sitting over the Sunshine Coast giving rise to increased storm activity. Mr Wardle said the focus of severe weather would be on the Sunshine Coast and Wide Bay to our north. He said there was potential for winds stronger than 90kmh and larger hail. While the main risk was for today Mr Wardle said going into Wednesday there was the possibility of showers and the chance of further thunder storms in the hinterland. "It is going to be a showery, wet few days in the coastal areas in the south east of the state," he said. "We are now well and truly into storm season." Tuesday will reach a day time peak of 39 degrees while Wednesday's is expected to drop to 27 degrees on a partly cloudy day with light winds apart from the potential for thunder storm activity in the hinterland. Thursday would see cloudy conditions with a medium chance of showers and a hinterland storm with winds otherwise light throughout. It would reach a maximum of 28 degrees after an overnight low of 18. Friday will continue a wet week with 70% chance of some rain and with falls up to 8mm possible. Winds are expected to be light again on a day the maximum will reach 27 degrees. Cloudy conditions with light winds and cooler maximums of 25 degrees are expected for the weekend but with east south easterlies developing Sunday afternoon.